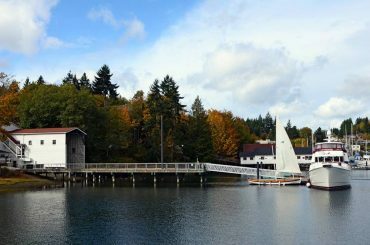 Dotted by net sheds and home to a small commercial fishing fleet, Gig Harbor’s downtown has preserved its designation as a working waterfront. This is where third- and fourth-generation Croatian families still continue their ancestors’ fishing trade that was once a booming part of the city’s economy. But fishing is not the only part of Gig Harbor’s maritime tradition. As Puget Sound became a mecca for pleasure-boating and sailing in the 1950s, boat designers and yacht enthusiasts alike made this quiet town on the west side of the Tacoma Narrows their regular destination. The attraction? Not just the picturesque setting but also the robust business at the local boatyards, recognized for their innovation. Boatwright Tom Regan, left, shares his expertise as part of the community boat-restoration program. 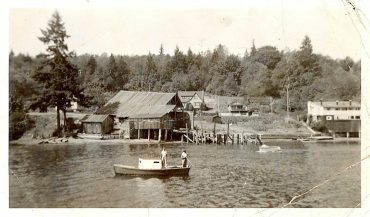 Yet unlike commercial fishing, boatbuilding on the Gig Harbor waterfront is mostly remembered through the community’s history. And the Gig Harbor BoatShop is trying to change that. 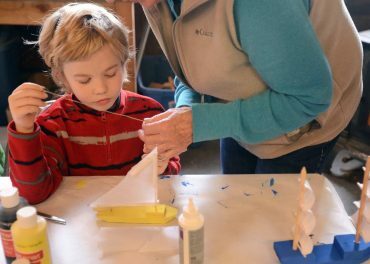 Operating out of the historic building that was once home to Eddon Boat Co., the nonprofit has made its mission to not only preserve this part of Gig Harbor’s heritage but also to inspire new generations of boatbuilders. “It’s about conserving history but also about utilizing the site to conserve maritime trade skills,” says Guy Hoppen, founding director and board president for the Gig Harbor BoatShop. Several thousand people come through the boatyard every year, including families who spend a weekend building their own boat. Since much of the 12-foot skiff is premilled and precut, the groups can comfortably complete their project on Saturday and Sunday, which also becomes launch day. 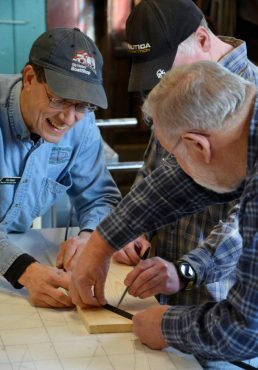 Coming from all over Puget Sound area, these boatbuilders-in-training have completed about 90 boats since the program’s inception more than three years ago. Hoppen says that the programs have changed over the years, as the BoatShop identifies what is successful and what isn’t. 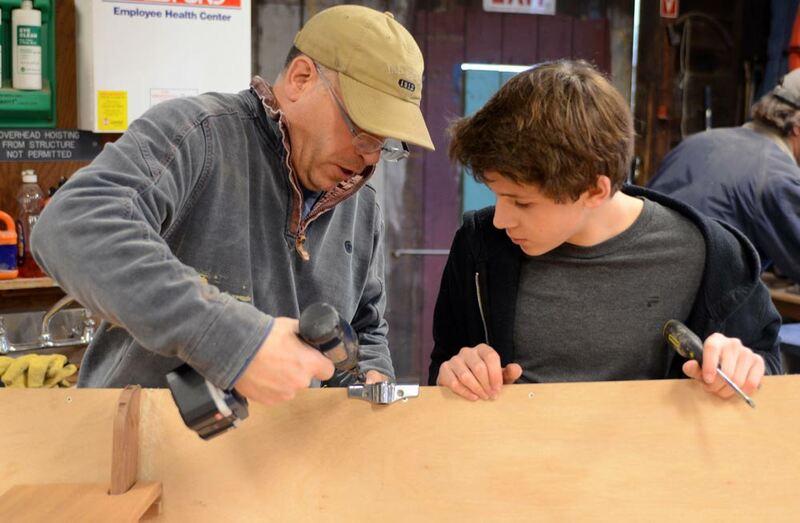 Among the newer offerings is a maritime mentorship program that pairs a master builder or restorer with a college intern interested in the trade. 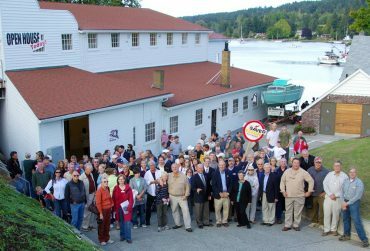 The gathering on the day the boatyard restoration was celebrated in late 2009 — following a grass-roots campaign and a voter-approved $3.5 million bond — included more than a hundred people, as well as First Gentleman Mike Gregoire and other dignitaries. “The idea is to pass on the skills to the next generation,” Hoppen says. The interns, who are paid, work largely one-on-one with the masters. The Hagerty Education Program at America’s Car Museum partially funded the mentorship. As with all the other programs, Gig Harbor BoatShop relies largely on grants, memberships and donations, as well as its annual fundraising auction. Another recent undertaking was a nod to the city’s history — documenting the Avalon, one of Gig Harbor’s best-known purse seiners. Built in 1929 at the Skansie shipyard nearby, the Avalon was declared derelict by the Department of Natural Resources after sinking in Hood Canal. Through grants and volunteer work, its wheelhouse is being restored at the boatyard and may become part of a traveling exhibit. The Anderson Boatyard — the Eddon Boatyard sits to the right of the structure pictured. The Anderson Boatyard was reportedly torn down in the early ’40s to make way for the existing facility. Eddon Boat Co.’s biggest claim to fame — far beyond Puget Sound — is as the birthplace of the Thunderbird-class sailboat. Considered revolutionary for its time, the Thunderbird is now part of nearly 30 fleets worldwide. More than 1,250 Thunderbird boats have been built, though in the 1970s, fiberglass and aluminum began replacing wood as the material of choice. Designed as part of a Douglas Fir Plywood Association challenge, the first Thunderbird was launched in 1958. Boatbuilder Ed Hoppen (who created Eddon Boat Co. with a partner in 1946 but later became sole owner) fine-tuned the design with his Thunderbird No. 2 and No. 3. Using the latter two boats, he created the prototype plans, which were originally sold for $2, according to the International Thunderbird Class Association. A family enjoys a boat they built as part of the family boatbuilding program. History came full circle when Thunderbird No. 2, the Pirouette, was restored at the Eddon Boatyard after the Gig Harbor BoatShop purchased it several years ago. Free community sailings are offered on the Pirouette when volunteer skippers are available. More than a decade ago, the Eddon property was slated for development into waterfront homes. 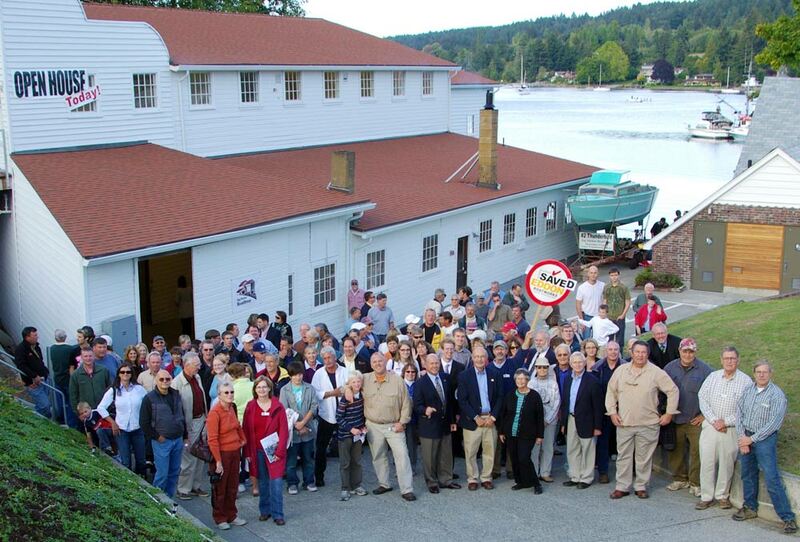 Recognizing the significance of 90 years of boatbuilding on the site, a grass-roots community group rallied to save it. 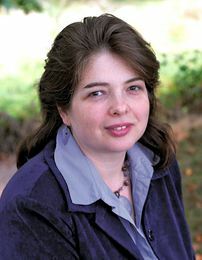 The group not only succeeded in lobbying the city of Gig Harbor to purchase the property but also in convincing the citizens to vote for a general obligation bond that paid for the acquisition. The Gaylynn, built by prominent Port Orchard resident Lee Caldwell in the 1940s, before being restored by volunteers in the community program. “Having grown up in Gig Harbor, I understand what a boatyard is and why it’s important,” says Hoppen, who was part of the small core group that started the “Save the Eddon” campaign. Hoppen, who also happens to be Ed Hoppen’s son and is one of Gig Harbor’s commercial fishermen, grew up in the family home next to the boatyard (the city also owns the home and may be leasing it to the BoatShop in the future). “The main motivation was to preserve the waterfront,” he says. More than $1.5 million in grants and other funding has been poured into the restoration of the building. The final phase — bringing back the marine railways that had to be removed during restoration — is about halfway completed. The restored Gaylynn. Originally gas-powered, the launch has been repowered electrically. The boat is among those available for the public to rent as part on the BoatShop livery program that opens the first weekend in June. “We will be able to haul bigger boats so we can do different types of projects,” Hoppen says. The Thunderbird wasn’t the only boat that eventually went from wood to fiberglass and aluminum. 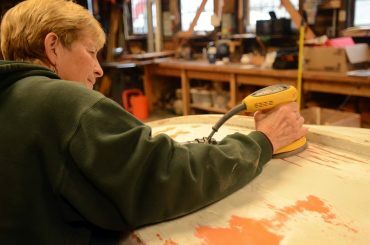 “In the 1970s, wood boats were in trouble but there was a renaissance,” says Tom Regan, who owns Grapeview Point Boat Works and has been building and restoring boats for 15 years. For the past four years, Regan has been spending weekends at the Eddon boatyard, sharing his skills and knowledge through the community boat-restoration program. 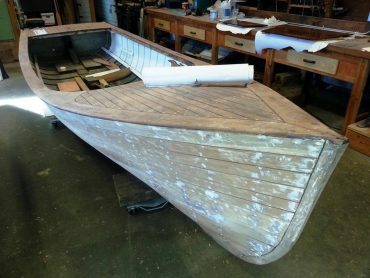 Volunteers from the program have restored about a dozen boats so far, and this summer will start building their first one, a 14.5-foot boat from stock design. A.R. 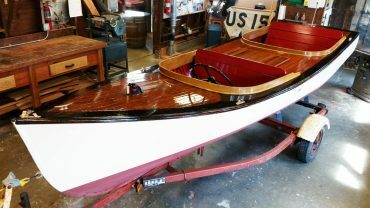 Fisk, an electric launch restored through the community boat-restoration program, is available to the public for rent. “It’s the camaraderie that brings us in. And we all love wooden boats — especially seeing the before and after,” says Nigel Davey, who’s been part of the community boat-restoration program for about 18 months. 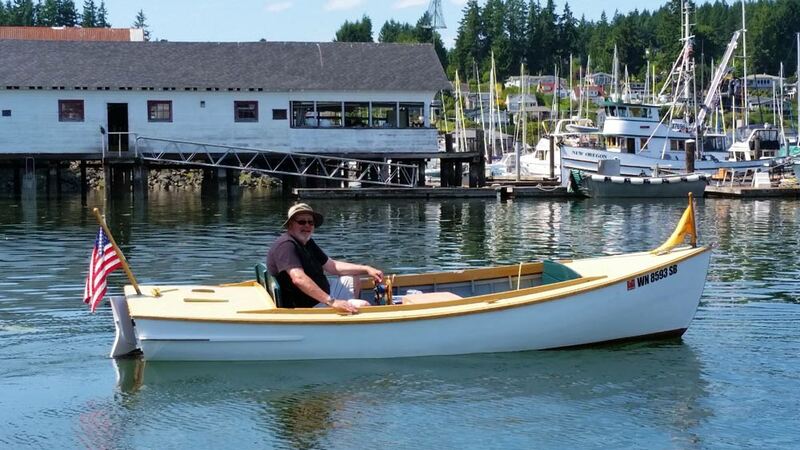 Davey was hooked on wooden boats after dropping in at the boatyard one evening and being asked to row Purpoise, a replica of the gig that mapped Gig Harbor back in the Capt. Charles Wilkes’ days. His eyes light up as he talks about Gaylynn, a 1941, 16-foot electric motor launch that was originally built by Port Orchard’s Lee Caldwell and donated to the Gig Harbor BoatShop by its second owner, Caldwell’s friend Allan Kane. Pat Lapp works on a project as part of the community boat-restoration program for women. Restored over a one-year period through the community program under Regan’s guidance, the Gaylynn (whose steering wheel came from a Model T Ford) is now part of the BoatShop livery. That means anyone can rent it during the summer weekends, for $30 an hour. In December, a special workshop is offered for children. That’s one of the great things about the Gig Harbor BoatShop. It doesn’t just offer a place where youth and adults alike can come to try their hand at restoring or building a boat. And it’s not like a museum, where pieces of history are frozen in time. The BoatShop makes that history come alive — and become accessible. In addition to offering boatbuilding programs, Gig Harbor BoatShop is open for tours of the Eddon Boatyard. A gift shop on the top floor of the building offers various maritime merchandise, books and information. The livery rental program is only open during the summer. 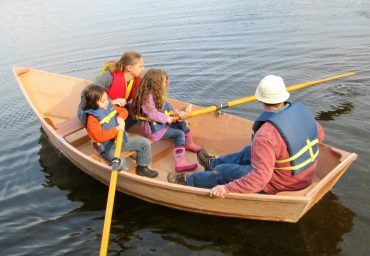 Smaller skiffs and rowboats rent for $15 an hour; two electric launches are available at $30 per hour. gigharborboatshop.org.